What does your thyroid do? In short, everything. Every cell and gland in your body depends on thyroid hormones to regulate its metabolism. “The thyroid gland governs how fast calories are burned by the body. It works collectively within the body, regulating hormones that manage a healthy metabolism,” explains, a holistic beauty nutritionist and co-founder of Zea Skin Solutions. Read: It’s also an MVP in regulating your metabolism (and, thus, weight). Your diet can affect the way your thyroid functions. To learn the best and worst foods for a healthy thyroid diet, we tapped Paula Simpson and three more wellness experts (including a naturopathic doctor) and Thumbtack personal trainers and wellness coaches. Ahead, they share the five best foods to consume—and seven worst—for a healthy thyroid. Take note! Okay, noted. What’s selenium? If you’re wondering, it’s a chemical element, like zinc and iodine, which are also recommended for a healthy thyroid diet (ahead on our list). “Selenium supports a healthy thyroid because it is essential for the conversion of the active thyroid hormone that burns calories and promotes a healthy metabolism, explains Simpson. Some foods that have high-selenium content include Brazil nuts (they’re the most nutrient dense source of selenium), halibut, sardines, turkey, eggs and spinach. Certified health coach Courtney Baron recommends seaweed for a healthy thyroid diet because it is dense with iodine, which is highly important for making the thyroid hormone. But the Thumbtack Health and Wellness Coach cautions against overconsuming it. “Too much iodine is a no-no for a healthy thyroid.” Her suggestion is to snack on nori sheets throughout the day. Kaitlyn Noble, Thumbtack personal trainer and wellness coach, also suggests fish and sea vegetables, like kelp, which are rich in iodine. For a double dose, she recommends a sushi restaurant. Done and done. Simpson explains that low levels of vitamin D have been found in people suffering from thyroid-related disorders, and vitamin D is believed to support overall thyroid health. What should you eat? 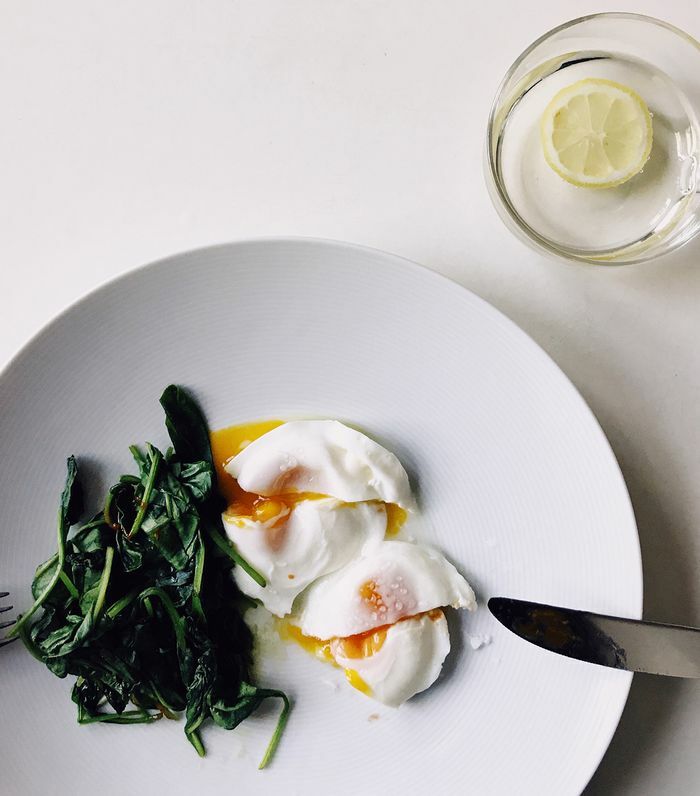 Baron suggests milk and Greek yogurt, which are good sources of vitamin D.
“Protein is crucial for all hormone production, but eggs specifically contain selenium, iodine, vitamin A, and the B vitamin choline, which are all great for thyroid health,” states Noble. She adds to not fear the yolk, because these nutrients all live there. “Zinc has been shown to improve thyroid hormone levels (particularly T3) among women with hypothyroidism,” says Simpson. Grass-fed beef, shellfish, legumes, mushrooms, whole grains, and garlic are good sources of zinc that she recommends eating. Pumpkin seeds are another good source of zinc. In fact, one cup equals 44% daily value of zinc, shares Rebeccah Shalev, ND, from Holtorf Medical Group. According to Baron, you should keep your cocktail intake to one to three a week to avoid a toxic effect on your body. “Not only does alcohol create a negative effect on the body’s ability to absorb thyroid hormone, but also in the thyroid’s production of it,” she shares. Noble’s wise words: “If you do drink, avoid sugary mixers (these can interfere further with our digestion).” (See below). “Don’t go overboard on cruciferous vegetables,” Simpson warns. “These foods contain a compound called glucosinolates that compete with dietary iodine and thyroid hormones. This includes cabbage, brussels sprouts, raw turnip, broccoli, and cauliflower. Avoid large quantities of these foods if you suspect a sluggish thyroid, and try cooking to break down glucosinolates and make nutrients more bioavailable.” Baron agrees. She adds that cooking them will have greater ease on the digestion system and reduce the chances of having a negative effect on the thyroid. “Lovers of tofu, soy burgers, and tempeh—proceed with caution,” warns Baron. “Soy contains estrogen, a hormone which interferes with the body’s ability to utilize the thyroid hormone.” Her suggestion is to keep soy intake at a minimum. Another thyroid no-no are fried foods says Baron. “Fried foods contain all the wrong kinds of fats, which block the thyroid’s ability to produce hormone, and is generally harmful to your health.” You will be missed, French fries. “Sugar wreaks havoc on the body,” says Noble. “This includes breakouts, energy slumps, and digestive issues. In addition to the damage we can see and feel, sugar causes invisible inflammation throughout the body. In addition to causing a slew of diseases, inflammation interferes with T4 conversion, necessary for thyroid function.” She had us at breakouts. Finally, Shalev explains that there is a tremendous correlation between gluten sensitivity and autoimmunity. “Approximately 90% of hypothyroidism is autoimmune in nature,” she shares. What does that mean exactly? Shalev explains that gliadin, a part of the gluten protein, is very similar in structure to the tissue of the thyroid gland. “The immune system can easily get confused between the two. When we eat gluten, this can trigger antibodies to gluten, which can then attack the thyroid gland by mistake. This process is referred to as ‘molecular mimicry’ and is believed to drive the autoimmune attack on the thyroid gland,” she says. Next up: See the one thing a thyroid expert eats for breakfast every day.